Good morning! I was trying to figure out what to cook and eat this week but not coming up with anything that sounded good to me. Then I checked my freezer to see what I had (This should have been the first thing I did! :). My problem was solved, I had lots of ideas. It's the old saying, “shop at home first”. This also helps use up my freezer storage and keep my budget in check. 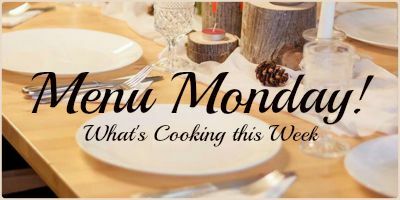 Monday: Salmon, rice pilaf, salad – I have salmon in the freezer and I'm going to try making it in my air fryer. My daughter has done this many times so I may be asking her for tips today. Tuesday: Pizza – I think it's time for some homemade pizza. Not sure what kind yet.. pepperoni? sausage? chicken & bacon? I'll see what I'm in the mood for when the time comes. Wednesday: Roasted chicken, buttered pasta, salad – I'll most likely roast my chicken in my Instant Pot, unless I decide to cheat and purchase a rotisserie chicken when I'm out shopping. Friday: Sausage & sauerkraut, air fryer roasted potatoes, green beans, salad – I have some Aidells Sausages in the fridge that I'll fry up with onions and serve with the sauerkraut. Sunday: Pork chops and gravy, brown rice, salad – I'm planning on baking my pork chops and using the juices to make gravy to smother them with and put over the rice.